Parrot 7.2.0 "Blue-crowned racquet-tail" released! living person, pouring their fine sand from the future into the past. This is the owner of the room, stalking through it with a preoccupied air. a waterfall that cascades endlessly into space. absurd actually existing are millions to one. On behalf of the Parrot team, I'm proud to announce Parrot 7.2.0, also known as "Blue-crowned racquet-tail". Parrot is a virtual machine aimed at running all dynamic languages. The blue-crowned racket-tail (Prioniturus discurus) is a parrot found on all the larger islands of the Philippines not starting with "P". On behalf of the Parrot team, I'm proud to announce Parrot 7.1.0, also known as "Lilian's Lovebird". Parrot is a virtual machine aimed at running all dynamic languages. + Fix SIGBUS in GC trace_mem_block on alignment-strict CPUs (arm), #1200. We traced all pointers by +1 and not by +4 or +8. + rakudo perl6 announced to drop parrot support. We detected and fixed two serious and two minor bugs which required a 7.0.1 hotfix release. was visible on machines with low memory. 3.6, but turned evil only with 7.0, when packfile got refactored. "We'll show him! We'll show them *all*!" "Okay," said Susan, "that was *definitely* evil -"
didn't do the insane laughter." dramatic music accompanying her that only she could hear. On behalf of the Parrot team, I'm proud to announce Parrot 7.0.0, also known as "Crimson Shining Parrot". Parrot is a virtual machine aimed at running all dynamic languages. New faster release Parrot 6.11.0 "Fischer's Lovebird"
On behalf of the Parrot team, I'm proud to announce Parrot 6.11.0, also known as "Fischer's Lovebird". Parrot is a virtual machine aimed at running all dynamic languages. Highlights: Performance: 15-25% faster, fixed GC, experimental VMS port. + Rewrote ResizablePMCArray with moving offset, esp on shift. + Add new traceflag -t20 for ResizablePMCArray states. + Added bigger t/stress/gc.t test to catch most GC issues. -- Tom Lehrer, "New Math"
On behalf of the Parrot team, I'm proud to announce Parrot 6.10.0, also known as "New Caledonian lorikeet". New supported release Parrot 6.9.0 "Rosy-faced Lovebird"
On behalf of the Parrot team, I'm proud to announce the new supported release Parrot 6.9.0, also known as "Rosy-faced Lovebird". Parrot is a virtual machine aimed at running all dynamic languages. 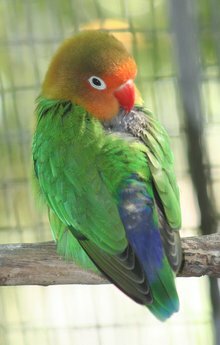 The name Lovebird stems from the parrots' strong, monogamous pair bonding and the long periods which paired birds spend sitting together. Lovebirds live in small flocks and eat fruit, vegetables, grasses and seed. Parrot 6.9.0 is available on Parrot's FTP site, or by following the download instructions. For those who want to hack on Parrot or languages that run on top of Parrot, we recommend our organization page on GitHub, or you can go directly to the official Parrot Git repo on Github. "Illegal escape sequence \o in 'string\o'". + Optimize utf8_substr. Do not use the slow utf8 iterator. and \v to be of cclass newline. [GH #1086, perl6 RT #122341]. Several chars 160..191 are not in the [[:punct:]] class anymore. Removed defunct Parrot_ascii_typetable, unused since 2010. + Updated the missing native_pbc 64-bit big-endian files on mips64 qemu. Parrot 6.8.0 "Little Lorikeet" released! On behalf of the Parrot team, I'm proud to announce Parrot 6.8.0, also known as "Little Lorikeet". Parrot is a virtual machine aimed at running all dynamic languages. On behalf of the Parrot team, I'm proud to announce Parrot 6.7.0, also known as "Grey-headed Lovebird". Parrot is a virtual machine aimed at running all dynamic languages. + Our GSoC student Chirag Agrawal successfully passed the final evaluation. All three project parts have been merged already.